[Image: A project by Brendan O'Grady/nocturnal design lab, suggesting what an inhabited billboard mast might look like; view larger. For another such project see BLDGBLOG's look at the awesome Single Hauz. 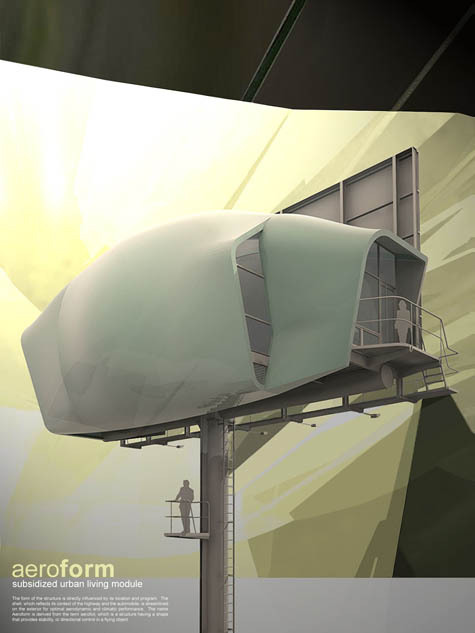 O'Grady's design was produced for, and won an award as part of, the 2007 KRob architecture competition; found via Archinect]. This is great. After living in LA for a little while, I've started to think that billboards must be a kind Patient Zero for early Southern California Soft-DeCon. Something about that smooth surface on the one side with the highly articlated superstructure on the other. This kind of brings it all back home again, nice.